The North Durham Cancer Patients and Carers’ Forum was formed in 2004 as a spin-off of the Derwentside District Reference Group. The Reference Group was funded by Derwentside District Council and managed by Verna Fee, the public involvement officer for the council. These meetings took place monthly, alternating between Consett Civic Centre and Stanley Lamplight Theatre. During the many discussions, meetings and presentations from various speakers that came to the group it was obvious there was a need to raise cancer prevention awareness to the general public. Ms. Fee obtained funding, and with the help of Val Davidson, the Cancer Lead for the Northern Cancer Network, together with Liz Boals from the Area Health Authority, formed The North Durham Cancer Patients and Carers Forum. The general public was invited to attend, but particularly cancer patients, their relatives and carers. The first informal meeting was held at Shotley Bridge Hospital and subsequent meetings held at the Community Hospitals in Chester-le-Street and Stanley, as well as in Consett. The group had a slow start but the number increased to about twenty-five people regularly attending. The professionals involved with cancer care were happy to attend these meetings, and the group benefited by being given accurate information. Members of the group in conjunction with the professional bodies attended various events. Members attended the events organised by the Northern Cancer Network at Newcastle where the group was informed of services and improvements in the North East. All this was done under the watchful eye of Derwentside District Council and the Derwentside Primary Care Trust. Following discussion by group members of the possibility of introducing complementary therapies for cancer patients, the University Hospital of North Durham set up a 6-month pilot allowing the charity "Coping with Cancer" to administer some complementary therapies to patients who attended the cancer ward and felt they would benefit from treatment. In April 2006, Carolyn Wyatt [Macmillan Information and Support Centres Manager] and Verna Fee [Involvement Manager County Durham Primary Care Trust] spearheaded Cancer Awareness and the Forum took part in a 2-year programme of Cancer Awareness Raising Events within local communities. The group produced leaflets, pens, key rings etc. to give out at public functions; e.g. Miners Gala, Lanchester Show, Stanley Fun Day and the Durham Fire Service open day. The group purchased a ‘Body’ that had removable internal organs, to be able to show the public where different cancers could be found through demonstration of this. Two events at the Dales Centre at Stanhope and County Hall, Durham, were very well attended and were for a group of people who were deaf. Verna Fee had moved on by this time and this event was organised by Mark Dunne Willows who was the Patient and Public Involvement Officer. In March 2008 the Forum was represented at the Stanley International Women's Week/Sure Start Event. Following this event, the awareness programme came to an end, due to lack of continued funding. Carolyn Wyatt was very enthusiastic and with some input from the group designed a new format for the cancer awareness leaflets. Carolyn was also instrumental in setting up the Cancer Information Centres in Durham, Chester-le Street and Shotley Bridge Hospitals. Sadly Carolyn is no longer with us, but because of her input The Information Centres are still a vital part of Cancer Awareness. The Forum has achieved much since the time it was established. Meetings have been very constructive, with members being able to propose and discuss ideas, which affected patients and carers in their area. And in a lot of instances these ideas have been adopted and implemented. With the re-organisation of the N.H.S., Derwentside P.C.T was disbanded and in July 2008 the running of the Group was taken over by the County Durham PCT, with Mark Dunne-Willows overseeing the group. The group also changed its name to the Durham Cancer Patients’ and Carers’ Forum. 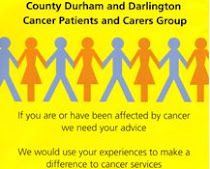 With the merger of the Durham and Darlington PCTs, the Group changed its name yet again in June 2009 to the County Durham and Darlington Cancer Patients’ and Carers’ Group. There have been many speakers over the years, from heads of departments explaining new treatments, to people talking about carers groups and Macmillan nurses talking about of their role in cancer services. Meetings were held around the County and in Darlington, but primarily at County Hall, Durham. The Group became independent of the Durham and Darlington PCT in February 2011. In 2012 it started holding meetings bi-monthly. To help the Group financially, the PCT gave a grant for start up costs in the first & second years. The Group now has become a Locality Service User Group for the North of England Network Service User Partnership Group, from which it has received some funding. Meetings are now held 4 times a year. The ethos of the Group is still to improve cancer journeys for existing, and future, patients and carers; with this in mind the Group continues to need new members with their fresh input and ideas.